The first print and candle were without the specialist so they had scant volume. But by the second and third candlesticks, GWR was open for trading and it had printed extremely unusual volume (purple square). 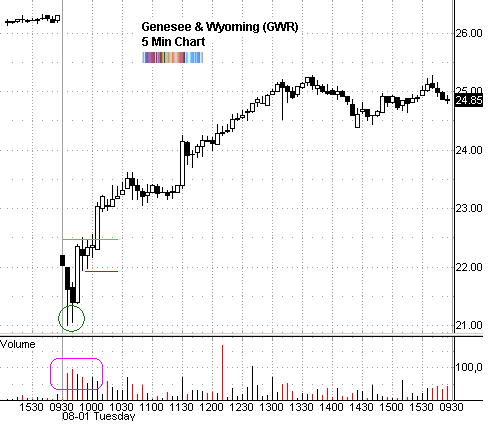 After the first 15 minutes of trading, it was obvious that GWR was not only a gap down, but it was in play. This is why I drilled down and looked at it through the shorter time interval of 5 minutes. The second and third candles left long lower wicks which meant that buyers were coming in and supporting price. On the daily, GWR had put in a nice double top and had now clearly cracked after spending some time dawdling below the long term moving average. But still, here was a hint that bargain hunters were stepping up. The next candle was wide range and it closed up! What’s more it was a very strong candle with the close being almost at its high. As well, this took price above the opening range’s high. The next few candles were narrower in range as price contracted. They weren’t terribly strong candles but they had higher lows (look carefully). The entry was at the break of the 7th candle’s high (green line) with the stop loss being below (red line). GWR trended up in a semi-orderly fashion and went through a few more contraction and expansionary phases - can you spot them on the chart? I featured this chart today to show that eventhough a stock gaps down with a terrible technical picture on the higher time frame, it can actually go up! Everything is possible when it comes to financial markets and often times it is what you least expect or simply ignore that will come to pass.